High Wycombe, UK, 26 September 2016 – At Restaurant Tech Live 2016 (27 – 28 September, ExCeL, London), Star Micronics will be demonstrating the future of POS connectivity with pioneering solutions from a number of its kiosk and software partners on Stand 1150. Star offers a range of flexible solutions that can easily be upgraded as your POS system evolves. From complex hospitality systems to a simple pop-up setup, Star has the expertise and wealth of experience to provide a tailored cost-effective solution. Leading the field in traditional POS and mPOS with the very latest Cloud Bluetooth and wireless counter-top and mobile printing solutions for tablet POS applications, Star’s customers encompass a range of hospitality operators including McDonald’s, Premier Inn and Costa Coffee. Excellent SDK’s provided by Star allow its hardware to be easily integrated with a variety of software solutions. 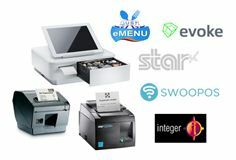 Star products that have been integrated by these partners show the full extent of the Star range and include the established TSP100 futurePRNT™ series to the innovative mPOP™ combined Bluetooth printer and cash drawer. Bizoutsourcing offers innovative and cutting edge iPad point of sale Just eMenu for restaurants, takeaways, cafés and bars. Just eMenu enables hospitality service providers to enhance the customer experience by having a quick and fully automated process. The solution comprises main POS and a separate kitchen App to make things easier and simpler for businesses at a very low cost. Its customers can not only enjoy a full set of features including self-ordering, table management, Chip & Pin or contactless card payments and printing support but also track performance with its unique performance management reporting suite. Evoke helps brands to engage with their customers in creative and innovative ways by designing and manufacturing interactive digital solutions. They supply kiosks, digital signage, self-service and software to retail, hospitality and libraries; major clients include McDonald’s and Debenhams. Integer provides inTouch, a touch screen epos system for fast food delivery, takeaway and table service, with Caller recognition, post code look-up, fast touch screen ordering, delivery driver management, extensive customer marketing including targeted text messaging and integrated on-line ordering. SWOOPOS is an innovative mobile point-of-sale system that connects seamlessly with the SWOOPE customer app to enable intuitive business management, mobile ordering / payment, powerful mobile marketing and rich data analytics.